Get your specialized and professional pest control from Florida Bee Removal and spend more time outdoors this year! Here in St. Petersburg, Florida, it’s easy to love spending time in the outdoors! We have many warm and sunny days throughout the year, and often when the rest of the country is hunkering down for the winter, we are still out enjoying the sunshine. If you have a pest control issue on your hands, however, it can make the outdoor areas of your home or commercial building not only frightening, but potentially dangerous as well. 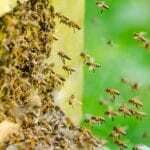 Here at Florida Bee Removal we want to help you with our specialized skills in pest control for bees and other stinging insects. Bees and stinging insects can include anything from a common wasp to yellow jackets, mining bees, mud daubers, hornets, carpenter bees and cicadas. While we don’t mind a few of these insects for their pollenating capabilities, the last thing we want is a swarm of angry bees or a large nest of hornets built somewhere on our property. At Florida Bee Removal we are here to assist you in the removal and pest control services for your stinging insects. Because our pest control services are more specialized, you can expect superior service and knowledge about your particular pest that we are identifying. We can make accurate and educated guesses as to where the problems might lie, as well as give you helpful tips to keep you and your family or employees safe from future swarms and nests. This knowledge comes in handy when you need someone to determine if your stinging insects were carpenter bees, which can burrow into the wood of your home like termites, or a standard yellow jacket, which doesn’t harm your wood. If you want specialized and thorough pest control in St. Petersburg, give us a call here at Florida Bee Removal!